December 24, 2003 [See here] article titled Unusual luminosity follows priest. Reported in [Spirit Daily.com] online newspaper. Ten years ago my wife and I were in Medjugorje and heard an extraordinary sermon by a luminous, white-bearded, almost St. Nicholas-like priest who was with a group from Chicago and was up there in the pulpit telling a riveting story. It was about a man who had risen from the despair of alcoholism to become a priest -- at the age of 66! It was a story about a fantastically successful late vocation. At the end of the sermon, this priest, this homilist, shocked everyone by explaining that he was the man he was talking about, the alcoholic. He was the one who had risen from the pits. He was the late vocation. We didn't get his name at the time -- weren't even sure exactly what city he was from -- but the homily was unforgettable. Months later, back in New York State, we were trying to find a priest to bless the apartment in which we were living when we first married. It was awkward. It was a new city, and we didn't know any priests to approach. These days, it is an odd request. Some priests have not even been trained to do so. And we really wanted that. We had even asked folks to help us find the right priest but still had no luck when the phone rang one day, the feast of Corpus Christi. It was a priest from Connecticut who identified himself as Father Joseph Whalen. I had never heard of him before. He said that someone at my publisher's told him to call. They knew I was doing research on angels and he was sort of an expert on the Archangel Raphael. That was his ministry, he told me; he distributed specially anointed healing oil and St. Raphael cards that many claimed caused miraculous effects. He was going to be in the area that day, he told me. Would I mind if he stopped in? By all means, I said. But first I had to go to Mass. It was a feast day. Don't bother, he told me; he would say Mass in our apartment. He would bless it. Finally we had a priest to anoint our apartment! Later that day, when Father Whalen and two companions arrived, I opened the door only to find that he was the same priest we had seen at Medjugorje -- the one who had been with the pilgrim group and had given that tremendous homily! Out of the 27,000 active parish priests in the United States, and more than 160 in our own little diocese, here he was at our door. As I was soon to learn, it was only the beginning of extraordinary events that regularly occur around him. His story? Father Whalen was born July 14, 1923, in Quincy, Massachusetts, the oldest of seven boys. His uncle was a bishop who wanted him to be a priest. He wanted nothing to do with it. As a teenager he worked as a clam-digger -- and started drinking whiskey with the men. After graduating from high school, he served in the Navy on a submarine chaser, hunting German subs. And drinking more. By this time he was developing shakes and even blackouts. "Many nights I staggered back on board the ship with my clothes ripped or a shoe missing," he recounts. "Countless nights in nameless ports around the world, I woke up in filthy, alcohol-stained clothes -- too drunk to care where or how I slept." You get the point.He had turned into an alcoholic at a young age and it grew. After a year in the maritime service, Whalen was hired by the New England Telephone Company as a office equipment installer. By this time he was also married to a woman named Frances and they had children. Over the next 32 years he worked his way up to second-level management. But there was constantly the alcohol, and it would end his marriage. "Frances was always running interference and apologizing for my stinking behavior," he now recalls of his former wife, who died a while back. "I would slur my words and stagger around yelling at everyone who crossed my path. My filthy and obnoxious behavior sent everyone into hiding." Finally Frances dragged Whalen into court, where their marriage ended in a bitter divorce. "I was loaded with guilt and remorse for my lifestyle and for my terrible behavior toward my wife and children. My soul was so stained, my actions so depraved, that I prayed to get cancer and die." Desperate for help, Whalen went to a Franciscan shrine to see a priest named Father Henry Lawler, who took him to his first Alcoholics Anonymous meeting. The day he met Father Lawler was the last day that Joe Whalen had a drink. The priest also heard the future priest's Confession (his first in 15 years) and told him to go to church and speak to Jesus. "I did," remembers Father Whalen. "I fell on my knees and surrendered to Him, as best I could. That's when I started to go back to church." And that's when things began to happen. Whalen, not yet a priest, became fascinated by angels, developing a special devotion to Raphael and the Book of Tobit. He read the Bible cover to cover. He read Thomas Aquinas. Along the way, he met a mystical, cloistered nun named Sister Mary Michael of the Precious Blood Monastery in Manchester, New Hampshire. "At our first meeting, sister looked deeply into my glazed, alcoholic eyes and said softly, 'Joseph, I see you as a priest. 'Tears began to stream down my face. 'What do you mean? You must be kidding!' I was bawling my eyes out as I remembered the uncle who once spoke to me about becoming a priest." Sister Mary Michael said she could see Jesus pardoning Whalen's sins and opening the skies to let his mother, who always wanted one of her sons to be a priest, peeking down at his ordination. He knew then that he had a calling. All he could think of was how unworthy he was. But she kept saying, "Don't talk like that," and shortly after, in 1983, Whalen began receiving visions. "After prayers, with my eyes closed but before going to sleep, I would first see pinpoints of light, then whole fields of brilliant bluish light, pulsating like a kaleidoscope. Then the visions would disappear. The visions continued every night for seven months. Sometimes I would see Jesus suspended from the Cross, one heart with two circlets of thorns around it, or two hearts with thorns around them. Many times I would see a big white dove heading toward me as the field of vision became an intense blue-white. In the last vision I saw two angels suspended with their wings fluttering and a dove gliding toward them." To make a long story short: Joe Whalen entered a seminary and became a priest. His marriage was officially annulled because of the alcoholism that had predated it and he spent four years in graduate studies at Pope John XXIII National Seminary in Weston, Massachusetts -- where he was the only one in a class of 19 who was a divorced alcoholic with only a high school education! He was ordained on January 28, 1989, and at the age of 80 is a very active priest -- even traveling nationally. A more uplifting, devout priest you will not find. He is a ringing testimony to the value of late vocations, a clarion call for the Church to pay close attention to those who may heed a call late in life at this time when priests are in such short supply. The prayer cards? They show Raphael appearing to Tobiah and have [a special prayer] requesting the great angel's intercession. Nearly ten years ago Father Whalen already had gathered the written testimonies of eighty people who claimed relief or outright healing from seizures, leukemia, heart problems, and cancerous tumors. No one knows what the count is now. "I just can't tell you how wonderful it is to experience the prayer power and miraculous workings of the St. Raphael prayer card," wrote a woman named Ginny. "And day by day I have felt the lump disappearing. My doctor tells me I am one of those people who they cannot explain but I am very much aware of what has happened through faith in St. Raphael." "I was diagnosed with leukemia found in my blood tests," wrote another. "I had been sick for some time until my wife obtained a St. Raphael card from a friend who told us to pray for healing. My family began to pray, and when I went back for more blood tests, the leukemia was gone!" Claimed a woman identified only as Mildred: "My 15-year-old grand-daughter, Laurie, had cancerous lumps all over her body. They all disappeared. Now she has only scars. Her cancer is in remission." Naturally, we can't verify all these claims. There are more. There are accounts of healing for lesser problems also. There are calcium deposits that have gone, there are habits that have been kicked, there are emotions -- like Father Whalen's own -- that have been repaired. 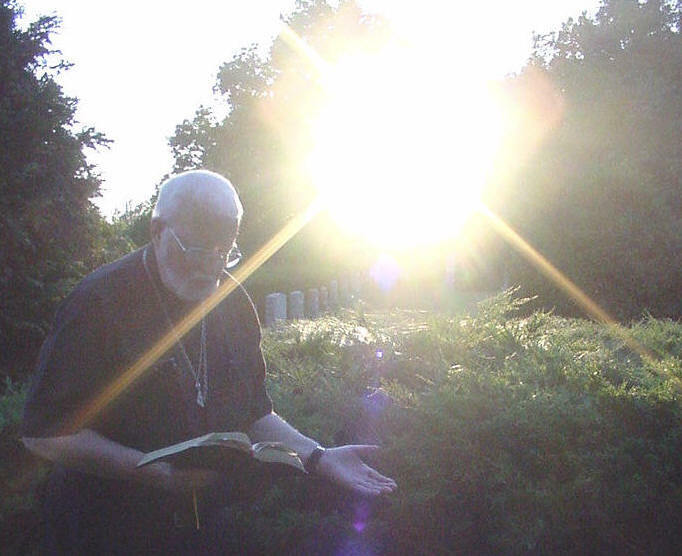 This is a man of faith, a man who prays for 12 hours over vats of holy oil, a man who was praying on a stormy day at a St. Pio shrine in Barto, Pennsylvania, recently when, according to one witness, the clouds suddenly parted and a ray of sun illuminated the luminous priest! They swear the clouds formed an image of Padre Pio. Ah, yes, Father Joe Whalen -- now at St. James Church in Danielson, Connecticut. He dispenses healing oil and the special St. Raphael prayer cards everywhere he goes as a Missionary of LaSalette, which is celebrated September 19. One heckuva a priest -- the one God sent to bless our apartment when there was no one else, the one who presided over his former wife's funeral, and has baptized five of his grandchildren. The drop-down drunk who is now a hero to his children. "God does draw with crooked lines, you know that," says the priest, who stopped in on us again last week. As for his calling: he urges the Church to promote late vocations at this time of crisis and still thinks of that nun who has been cloistered for more than fifty years now and with whom he remains in touch. "When I visited Sister Mary Michael again, she said, 'Joseph, I am convinced that your mother got a glimpse of your ordination," recalls the priest. "Jesus surely parted the skies to allow her to look down from Heaven and see the fulfillment of her prayers." Learn more about Father Whalen [here].